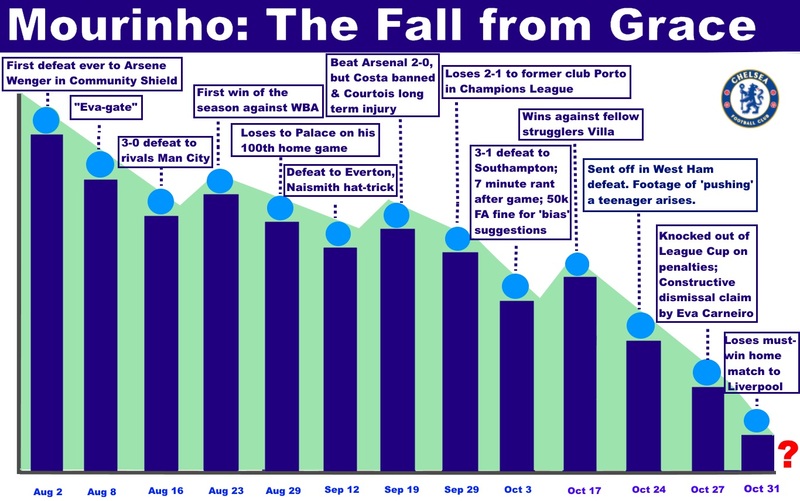 Mourinho: Charting his fall from grace - Soccerjury - Defining the game through you! 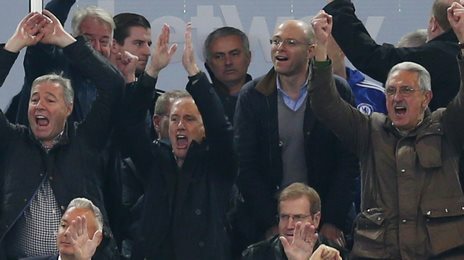 Jose Mourinho has lost his must-win game today 3-1 against Liverpool at Stamford Bridge. This desperate defeat leaves Chelsea languishing in 15th place and just four points above the relegation zone. This is the worst ever start by a Premier League champion to the start of their campaign. This loss now begs the question: What now for Chelsea's Special One? Whatever happens to Mourinho over the coming days, his perception to most Chelsea fans will not change. If he keeps his job or is fired, he will always remain a legend at the Stamford Bridge club. But if Abramovich does give the Chelsea manager one more chance, then Mourinho can find inspiration in Sir Alex Ferguson's long and distinguished reign. The legendary United manager was reportedly just one game away from being sacked, before he turned things around to create the greatest dynasty in English football. As in life, but the greatest plaudits are usually reserved for the courageous who can find hidden reserves to ride out the fiercest storm and then succeed. If Mourinho is able to inspire a Lazarus-like recovery in Chelsea, this may prove to be Mourinho's greatest triumph in his managerial career. For isn't there a famous proverb saying that the greatest victory is borne in the greatest adversity? Mourinho has monopolised success in four of Europe's biggest leagues for the past fifteen years, and this is the first instance in his career that his Midas touch has deserted him. But perhaps in this most unexpected of positions, the Special One may have just been gifted a unique opportunity to further his status in the pantheon of managerial greats. He's under a huge amount of pressure and seems to be imploding. Undoubtedly a good manager, but he needs to arrest the slide and keep himself out of trouble.